Although cacti can survive in desert conditions by storing water within their succulent structures, Battarrea phalloides takes an exactly opposite approach: it looks like a dead, dried plant even when it is fresh and newly emerged from its underground 'egg'. In Britain this is a very rare find, although it may be more common than records suggest: despite its large size (specimens 25cm tall are not unusual) its 'dry stick' appearance does little to attract attention. The specimens shown above are also featured in Pat O'Reilly's bestselling book Fascinated by Fungi, published by First Nature in September 2016. In Britain Battarrea phalloides was - Classed as Endangered on the Red Data List of 1992. In the 2006 Red Data List Shelly Evans et al) it was recorded as Near Threatened. This UK Biodiversity Action Plan species is listed in Schedule 8 of the Wildlife and Countryside Act 1981, which makes it illegal to either pick or in any other way to destroy this fungus or its fruitbodies. It is therefore a 'find and photograph only' fungus. Described first in 1785 by Scottish botanist James J Dickson (1738 - 1822), who gave it the name Lycoperdon phalloides, the Sandy Stiltball was transferred to the genus Battarrea by Christiaan Hendrik Persoon in 1801. 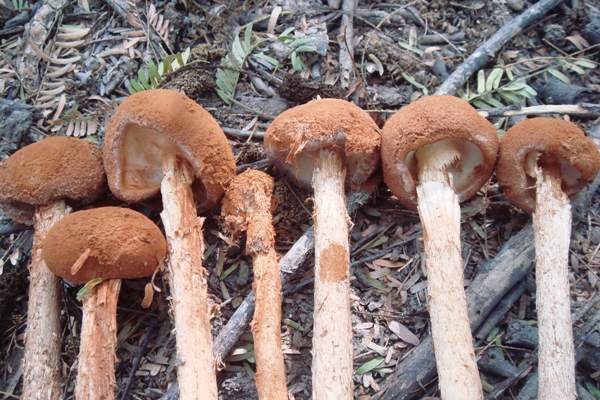 Synonyms of Battarrea phalloides include Phallus campanulatus Woodward, and Lycoperdon phalloides Dicks. A very rare find in Britain, and officially recorded mainly from southern England, this strange-looking fungus occurs in Europe, Asia (notably China), Africa, Australia and both North America and South America. There is disagreement as to whether Sandy Stiltballs found in Europe are truly co-specific with Battarea phalloides as found and defined in North America, and some authorities place the European spacimens under the species name Battarrea stevenii. The Battarea genus was named after Italian mycologist A C J Battarra, while the specific epithet phalloides means phallus-like, while the generic name Battarrea honours the Italian mycologist Giovanni Antonio Battara (1714 - 1789). The conical to hemispherical cap is covered initially by the upper part of the universal veil, beneath which there is a spore sac attached to the stem. 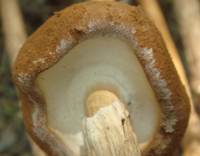 When the dried out upper part of the universal veil blows away, the rusty-brown upper surface of the spore-bearing layer is open to wind and rain, and in this way the spores are dispersed; the underside of the cap is buff. Cap diameter ranges from 1 to 4cm. Typically 10 to 25cm tall (exceptionally to 40cm) with a diameter 4 to 15 mm; scaly or fibrillose; rufous brown; base volva-like. Spherical (or nearly so), minutely warty, 5-6.5µm in diameter. 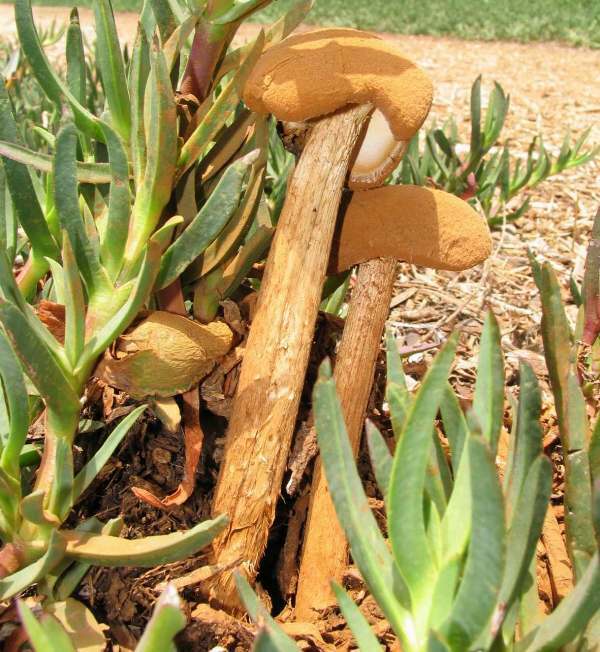 Saprobic, in dry sandy areas such as hedge banks or beneath deciduous trees, particularly on raised sandy banks. September to November in Britain. This is the type species of the Battarrea genus and the only species in this genus known to occur in Britain. 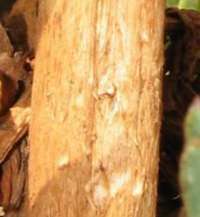 Other stiltballs, such as Tulostoma brumale, are much smaller and do not produce rusty-brown spore dust. The Sandy Stiltball is tough and inedible, and because of its rarity the fruitbodies may not legally be gathered in Britain. Pegler, D N, Laessoe, T, Spooner, B M. (1995). British puffballs, Earthstars and stinkhorns, an account of the British gasteroid fungi. Kew: Royal Botanic Gardens. Dickson, J (1785). Lycoperdon phalloides in Fasciculus Plantarcum Cryptogarricanum Britanniae, 1, 24. This page includes pictures kindly contributed by Doug Collins.